Thursday evening, I had the pleasure of attending the kick off reception at the National Museum of the American Indian (NMAI) in Washington, DC for their new exhibit, “Best in the World: Native Athletes in the Olympics.” This special exhibit, which runs through September 3, is timed to honor the 100th anniversary of the performance of two Carlisle Indians in the 1912 Stockholm Games but doesn’t limit itself to just their performances. In fact, the first thing one sees upon entering the exhibit is a blown-up photograph of Frank Mt. Pleasant broad jumping while wearing his Dickinson College jersey. 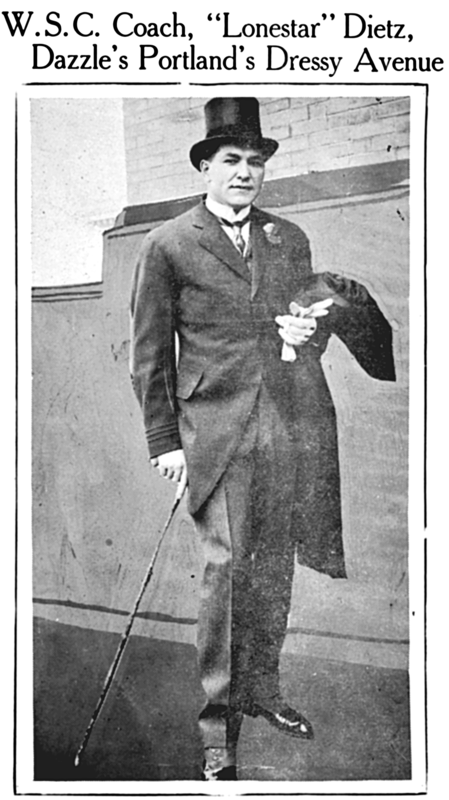 He competed in the 1908 games in London. The exhibit also includes a photo of Frank Pierce, younger brother of Carlisle football stars Bemus and Hawley, competing in the marathon in the 1904 Games held in conjunction with the St. Louis World’s Fair. He is believed to have been the first Native American to compete for the United States in the Olympics. Enough about the exhibit, you can see that for yourself. At the beginning of the reception, the dignities present were introduced. There is no mistaking Bill Thorpe due to his strong resemblance to his father. Bill is lending the use of his father’s Olympic medals to the NMAI for this event. Lewis Tewanima’s grandson was also present. He took the time to explain the importance of the kiva to Hopi culture. It was quite enlightening. Billy Mills, who broke Lewis Tewanima’s record for the 10,000 meters and won the gold medal in the 1964 Olympics spoke and was taped by a cameraman as he walked from exhibit to exhibit. Some writers were also in attendance. 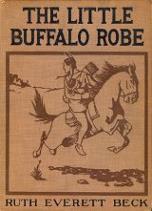 Robert W. Wheeler, who wrote the definitive biography of Jim Thorpe, and his wife, Florence Ridlon, whose discovery of the 1912 Olympics Rule Book behind a Library of Congress stack made the restoration of Thorpe’s medals possible, was also present as was Kate Buford, the author of a recent Thorpe book. The apple didn’t fall far from the Wheeler-Ridlon tree as their son, Rob, whose website, http://www.jimthorperestinpeace.com, supports the effort to have Jim Thorpe’s remains relocated to Oklahoma. 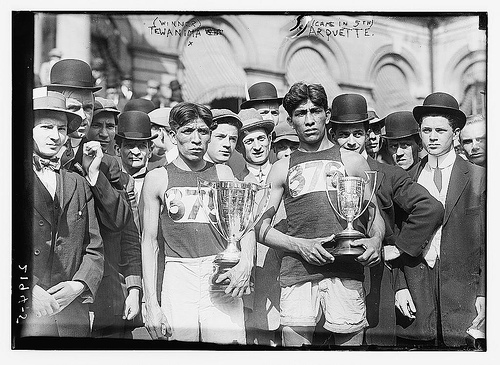 Tonight, the National Museum of the American Indian (NMAI) in Washington, DC holds a reception to kick off its new exhibit, “Best in the World: Native Athletes in the Olympics,” to celebrate the athletic achievements of Native Americans on the 100th anniversary of the 1912 Stockholm Games that featured legendary performances by Jim Thorpe and Lewis Tewanima. I am attending because Bob Wheeler, Jim Thorpe’s Boswell, is to speak there. While making preparations for attending this event, I received some unexpected news. The National Football Foundation (NFF) released its selections for induction in the College Football Hall of Fame Class of 2012 and Lone Star Dietz was finally on the list. As blog followers probably know, Greg and John Witter, first cousins and rabid Washington State football fans, and I campaigned to get Dietz placed on the Hall of Fame ballot some years ago. Getting his won-loss record corrected was the key to getting him nominated but there were larger obstacles yet to come. 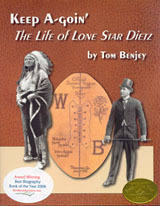 Lone Star Dietz died in 1964 and there are few people still alive that knew him. Also, he coached at schools with smaller alumni bases and less clout than the major football factories. Washington State, for example, couldn’t muster the support for him that, say, Ohio State could for John Cooper or Michigan could for Lloyd Carr. 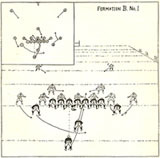 While both these recent coaches had very good careers, neither had the impact on the history of the game as did Dietz. It’s one thing to inherit a strong program and be a good steward, but it is quite another to rebuild a floundering program from the ground up, something that Lone Star did multiple times. The closest he came was in 2006 when the selectors chose Bobby Bowden and Joe Paterno instead of the people who were on the ballot. A couple of years ago, when Lone Star’s name was dropped from the ballot, I gave up all hope of him ever being selected. I didn’t even know that his name was on the Divisional ballot this year, so was shocked when I started receiving phone calls from reporters on Tuesday afternoon. All I can say is that it’s long overdue. Although he’s being brought in through the back door, so to speak, he will finally be in. He’s the first Carlisle Indian to be inducted as a coach; the rest were as players. Whether this honor is enough to offset the many indignities Dietz suffered and mollify the Lone Star Curse is yet to be seen. This year is the 100th anniversary of the 1912 Olympic Games that were held in Stockholm, Sweden. 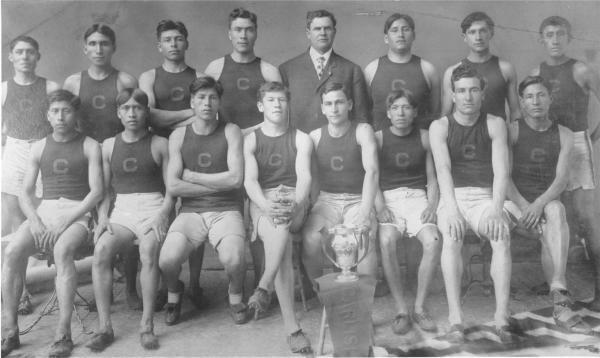 What makes that important to us is the participation of two Carlisle Indians: Jim Thorpe and Lewis Tewanima. Writers across the country and even from England are working on articles about these games and the two men who starred in those games. The National Museum of the American Indian (NMAI) in Washington, DC is even opening an exhibit concerning American Indians’ participation in the Olympics on May 24. As a result, experts such as Bob Wheeler are being interviewed by various reporters and other writers. Even I am being asked to verify details. The other day, I got a phone call from someone about a detail about which I had never given any thought: exactly when was the decathlon competed in the 1912 Olympics? Fortunately, with the use of the Internet, the answer could readily be found. The 1912 Decathlon was competed over three days. On the first day, July 13, the 100 meters, long jump, and shot put were held. The second day, July 14, hosted four events: 400 meters, high jump, discus throw, and 110 meter hurdles. On the third day, July 15, were the pole vault, javelin throw, and 1,500 meters. Something that I find interesting is that Jim Thorpe tied for third in the pole vault, an event for which his physique was not well suited. Pole vaulters tend to be wiry, something that Thorpe wasn’t. Yes, he had tremendous upper body strength, but that was offset by his overall body mass as muscle is heavy. His great leg strength and running speed probably made up for his weight as he cleared 3.25 meters (10 feet 7.95 inches) in those pre-fiberglass pole days. The decathlon was a battle of endurance as much as anything. Of the 29 athletes who started the event on the first day, only 12 finished all 10 events. Among the non-finishers was Avery Brundage. After finishing 10th in the pole vault, Brundage dropped out without competing in the javelin or 1,500 meters. Even at that, he is listed as placing 16th in the decathlon. The photo in the previous post turns out to be from the 12-mile “Modified Marathon” held in New York City on May 6, 1911. Lewis Tewanima (#375) finished first and teammate Mitchell Arquette (#376) came in fifth out of a field of over 1,000 runners. Both received solid silver gold-lined loving cups as prizes from The Evening Mail, sponsor of the big race that was covered by all the New York City newspapers. 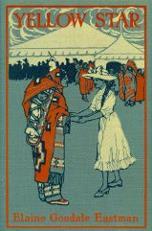 The New York Times article titled, “Little Tewanima Wins Marathon,” began “Tewanina, a ward of the Nation and a student at the Carlisle Indian School, yesterday demonstrated the superiority of the red man as a foot runner over a cosmopolitan field which numbered nearly 1,000 athletes of all sorts and conditions in the so-called modified Marathon — the distance being twelve miles — under the auspices of The Evening Mail.” The crowd viewing the race was estimated at over 1,000,000 people. The New York Herald coverage featured a cartoon of Tewanima that was reproduced in the Carlisle Indian School newspaper. Shown in profile, Tewanima sports a diamond stickpin in his necktie, something he probably couldn’t afford from his earnings as a student. It isn’t clear yet if it was a prize for winning this race or a previous one. Regardless, he and the others clearly competed for prizes. A French baron, Pierre Frédy de Coubertin, founded the modern Olympic movement in part as a way to inject the authentic ancient Greek ideal of a sound mind in a sound body into modern nations in danger, he believed, of becoming physically unfit and thus morally soft. By 1912, for the Fifth modern Olympiad in Stockholm, each competitor had to sign an entry form affirming that he or she was an amateur—“one who has never” competed for money or prize, competed against a professional, taught in any branch of athletics for payment (i.e., been a coach) or “sold, pawned, hired out, or exhibited for payment” any prize. After reading this, I conclude that very few American athletes would have been considered to be amateurs by these standards. Never having competed for money or prize would have eliminated most of them. Winners of events at major track meets were often awarded prizes in those days. Gold watches were one of the more common prizes. Silver loving cups were probably more common, and medals were likely the most common prize. Gold watches, silver cups and medals sound like things of value to me. If memory serves (my research sources aren’t available to me right now), the Penn Relay Carnival awarded prizes to winning relay teams. 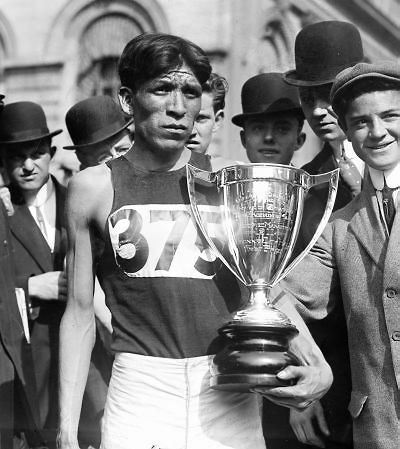 Also, I think there is a famous photograph of the great distance runner from Carlisle Indian School, Lewis Tewanima, standing next to a table loaded with prizes he won in races. No complaints were filed about his, or other athletes’, having competed for such prizes. The press was filled with articles about Carlisle’s expected participation in the upcoming games. Various track meets, competitions and races winnowed the field down to those who would eventually participate. The Boston Marathon, which was run on April 20, was used to select the U.S. long distance team. Prior to the race Pop Warner thought that Mitchell Arquette, St. Regis Mohawk, would do even better than Tewanima. However, Michael J. Ryan, of the Irish American A.C. unexpectedly won the race and in world-record time. Andrew Sockalexis, Penobscot from Maine and not enrolled at Carlisle, came in second in conditions so muddy that runners had to run on sidewalks to get decent footing. After the conclusion of the race, the U.S. Olympic marathon team was set: Ryan and Sockalexis were selected as was Lewis Tewanima, the only Carlisle distance runner on the 1912 U.S. Olympic team. Apparently, the other Carlisle distance men didn’t do well enough in spring meets to qualify. Jim Thorpe had a good spring. He was running so well that Warner was quoted as saying , “the man who beats him in the 120 yard [hurdle] event at the Pennsylvania relay meet will have to stagger the world’s record.” In May Thorpe competed in a tryout for the Olympic Pentathlon, a new event that consisted of five track and field competitions: 1) Running broad jump, 2) javelin throw with best hand, 3) 200-meters flat race, 4) discus throw with best hand, and 5) 1,500-meters flat race. He had not thrown the javelin previously but was expected to pick that up quickly. Also new to him was the 1,500-meters run in which his stamina was expected to carry him. Thorpe easily qualified for the Olympic team by winning three events: broad jump, discus and 200-meter run. He placed second in the other two, losing to the national champion in the javelin and finishing two yards behind the leader in the 1,500-meters. His prospects for a successful Olympics were good. Also named to the U.S. team to compete against Thorpoe in the pentathlon and decathlon was Avery Brundage. Carlisle generated much press in the months leading up to the Stockholm games, a good bit of which was focused on the Hopi distance runners. 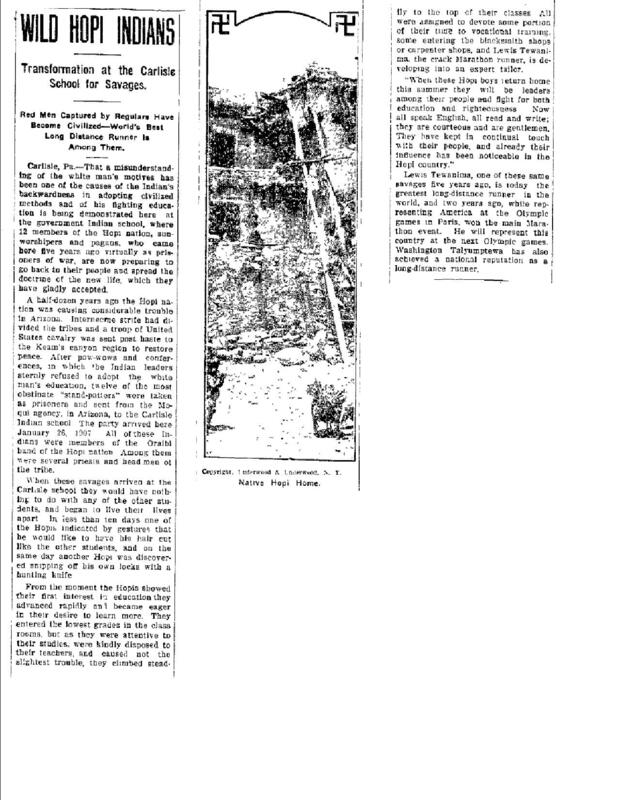 Rather than comment on it, I will present a particular April 1912 newspaper article in its entirety. Some think that 1912 was the year Native American broke onto the Olympic scene but, as shown in the last few blogs, they arrived much earlier. But 1912 was to be better for American Indians in the Olympics than the previous games. But it was not surprising. This youthful redskin hunts, plays lacrosse, tennis, indoor baseball, handball and hockey, all with equal skill, and can fill almost any position on a football team with credit. 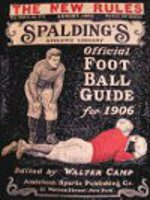 As halfback he probably is seen at his best, whirling, twisting, dashing and plunging, for one moment bewildering his opponents with lithe, panther like leaps, and the next crushing his way through the mass of would-be tacklers with the ferocity of a mad bull. 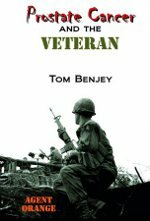 Although busy with track work while here, he practiced baseball and played amateur baseball since leaving Carlisle, refusing numerous offers to play on minor league teams. Louis Tewanima of Carlisle Indian School will be a starter in this year’s Boston Athletic Association Marathon race and hopes to make the American Olympic Games team. I have read that Gus Welch made the team but was unable to compete due to injury. Could he have been one of Warner’s mystery men? The 1908 Olympic Games were held in London, something that required Carlisle Indian School track stars Frank Mt. Pleasant and Lewis Tewanima to cross the Atlantic with the bulk of the U.S. contingent on the steamer Philadelphia. Neither arrived in the best condition. Mt. Pleasant had an injured ligament in his knee and Tewanima was suffering from sore feet and bad knees. The Hopi’s ninth place finish in the marathon was a great performance for a person who, a year prior to this, had not before worn a running shoe. He finished ahead of all the great British runners and Tom Longboat of Canada. Longboat, an Onondaga from the Six Nations reservation near Brantford, Ontario, was leading the race when he fell ill and withdrew from the race. The year before he had established himself as a world-class marathoner by winning the Boston Marathon in record time. Frank Mt. Pleasant, Tuscarora, also competed as best he could given his condition and finished sixth in both the broad jump and triple jump. Later that summer in Paris, he and Tewanima got a chance to show their stuff in a competition with some other Olympians. Mt. Pleasant won the broad jump by defeating both Frank Irons, the Olympic champion, and Edwin Cook of Cornell, the American intercollegiate champion. Lewis Tewanima came in second in the 3-mile race. Upon their return to the U. S. Mt. Pleasant and Tewanima visited President Roosevelt and, in New York, were presented with medals in addition to the ones they won in Europe. New Yorkers paid $3,100 for the medals they gave to the members of the Olympic team. Frank Pierce did not compete in the 1908 Olympics because he died of pneumonia earlier in the year. Next time we take a look at the later Olympics.